Over the past few years I been cultivating my beer snobbery. Long gone are the days when I would drink for drinking's sake. Now I prefer sitting around a table with friends and sipping a good beer. In my opinion, as breweries go, Bell's is up there with some of the best. This Michigan brewery has a range of very popular craft beers as well as an interesting range of seasonal brews. The Planet Series is their newest creation. 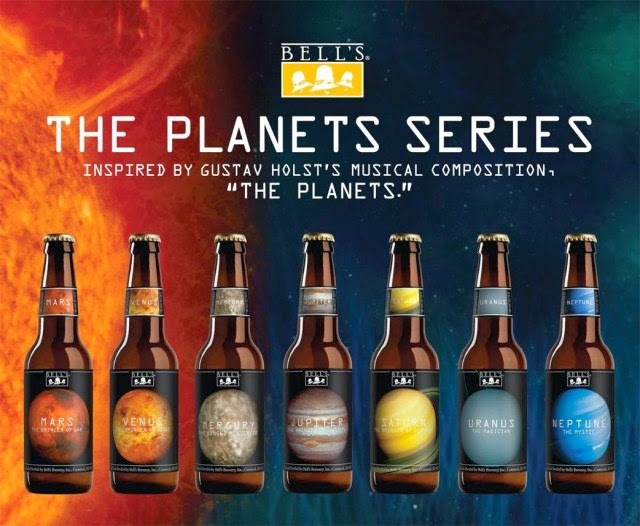 It is based on their Batch and Wheat Series and will feature seven different beers, each inspired by a different piece of music from the composer Gustav Holst (video below). The first Planet beer will be released in August 2014 with each successive Planet debuting about every two months after, ending in July 2015. If you aren't still mesmerized by all of the hoppy goodness, then you may be wondering "Where's Earth?" Well, if you read the names above then you probably notice that they are based on the astrological entities rather than the astronomical. And Earth gets all the beer anyway, right? So next question may be "Where's Pluto?" This isn't a Pluto-demotion issue but rather a result of the piece that The Planet Series is based on. Gustav Holst's "The Planets" predates the discovery of Pluto.